The ADTMWSF6 mobile PC workstation is an efficiency solution designed for your home office or business. Load up the fixed height shelf with a CPU or other electronic equipment to streamline a productive, yet space-saving work environment. 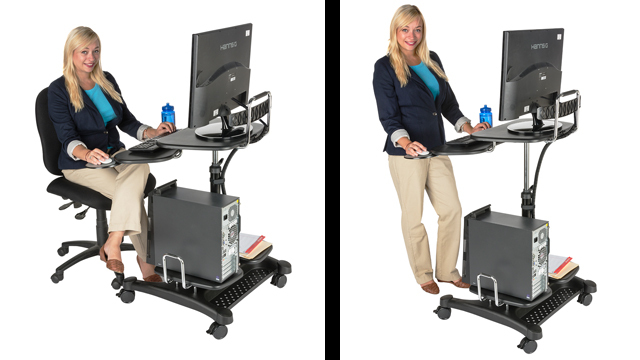 Simply roll the mobile pc workstation on its 4 wheels to remove it from harm's way, lock it in closet overnight, or move in front of an audience to deliver a presentation! The polypropylene and ABS plastic build is both durable and lightweight, allowing for easy mobility. Start the video to see this workstation's features highlighted and demonstrated! SAMANTHA (Narrator): "This all-in-one mobile PC workstation is a versatile solution for your home or office needs. With multiple tiers of height adjustable, durable plastic shelving , there  is enough room for a large variety of electronic equipment. The top platform is great for laptops or a flat screen monitor up to 27” and has a durable keyboard tray attached to it. The polypropylene base holds two small shelves that are perfect for a CPU, printer, or fax machine. It also has 4 wheels for easy rollability that can be locked to keep in place. A retractable mouse pad and cup holder attach to the keyboard shelf and can be modified for either left or right handed users. This all in one mobile PC workstation is a great ergonomic addition to any home or business setting."